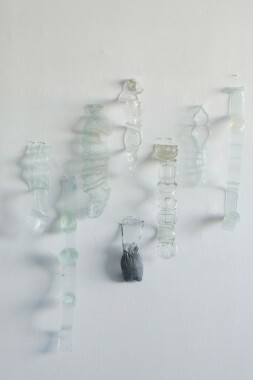 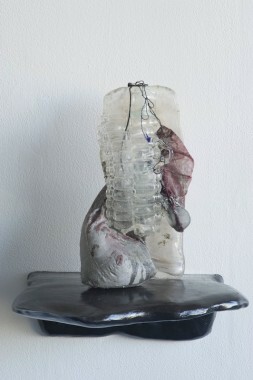 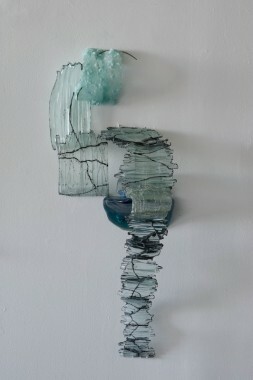 Polyphony, 2012, Glass, 11" x 13" x 6"
Wobbly Verticals, 2011, Glass, rubber, monofilament, cement, 41" x 31" x 4"
Delineating a Lack, 2012, Rubber, resin, wire, handmade paper, 22" x 13" x 6"
Getting to the Background, 2012, Glass, rubber, metal, wire, handmade paper, 17" x 18" x 8"
Fleshed Out, 2011, Glass, wire, fiber, resin, cement, rubber, 12" x 12" x 10"
Dalliance, 2011, Glass, fiber, cement, resin, 9" x 7" x 9"
Ligament, 2012, Glass, rubber, metal, handmade paper, monofilament, wood, 13" x 20" x 13"
Spill detail, 2011, Glass, metal, wire, rubber, resin, handmade paper, wool, 77" x 16" x 9"
Solo, 2012, glass, metal, rubber, resin, wire, 30" x 28" x 24"
Orphan, 2012, Glass, metal, rubber, cement, 36" x 29" x 22"
Laid Bare, 2012, Glass, metal, cement, 22" x 21" x 13"
Chronometry, 2012, Glass, wire, resin, epoxy, rubber, 32" x 12" x 8"
Delineation Drawing, 2012, Metal, handmade paper, paper pulp, rubber, 9" x 8" x 3.5"
Interior Structure, 2009, Wire embedded in handmade paper, 18" x 20"
Link, 2011, Paper pulp, ink and rubber on wire embedded handmade paper, 18" x 18"
Combinatoric, 2011, Paper pulp and rubber on wire-embedded handmade paper, 18" x 80"
Polyphony (detail), 2012, Glass, 11" x 13" x 6"
Nancy Cohen scavenges, accumulates and reconfigures the discarded detritus of daily life: tiny perfume bottles, a patterned plate, a blue mesh bag. 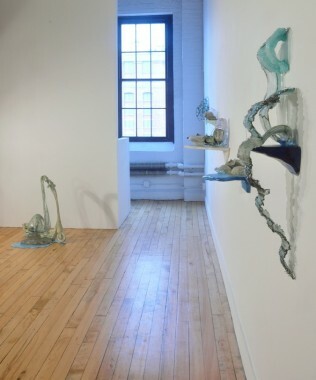 Cohen also fabricates forms which when combined with her found objects shape the visual vocabulary of the sculptures, large-scale installations and experimental paper-based works that make up this exhibition. 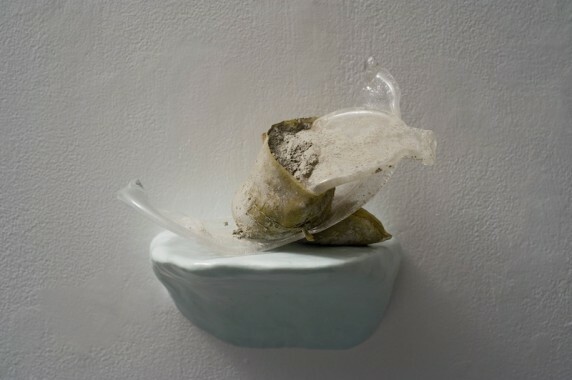 Cohens work addresses the extreme balancing act that contemporary life requires. 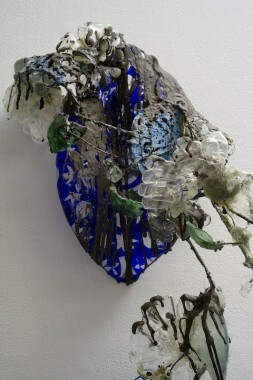 Human and environmental frailties are set against the power of the natural world - to alter, threaten, destroy or simply decay. 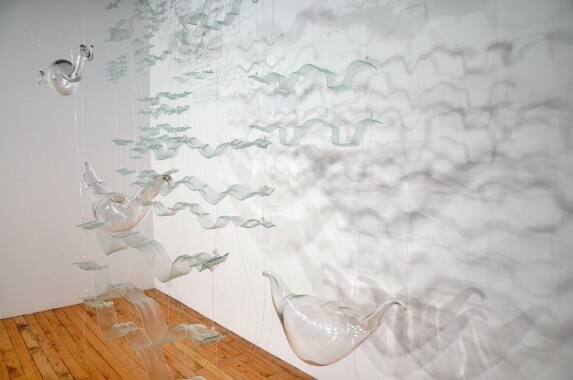 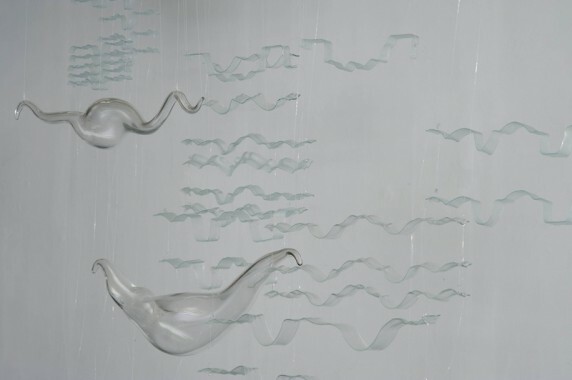 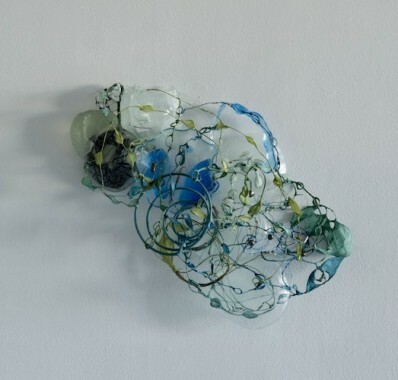 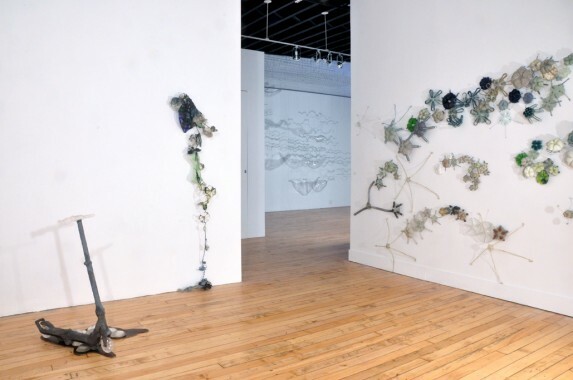 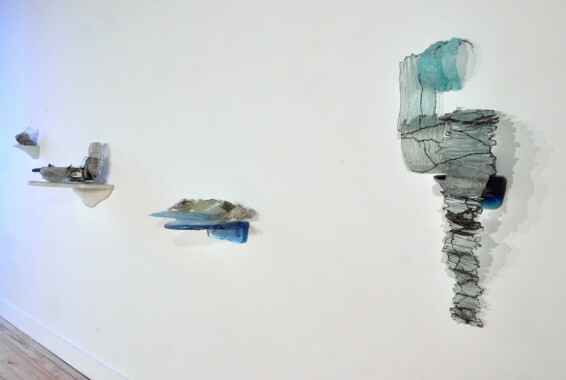 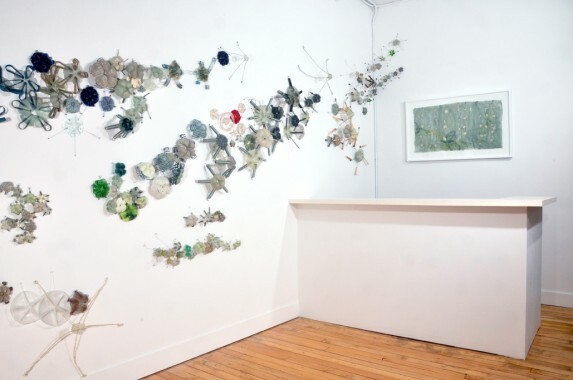 For her installation, P (n,k) Combinatorics, Cohen has covered the gallery walls with cast glass and cement forms that represent enlarged cellular structures but also resemble unearthly botanical life. 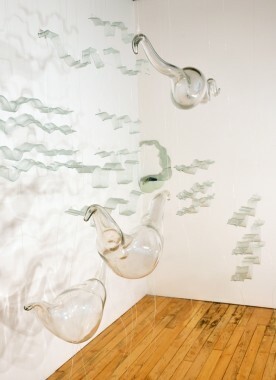 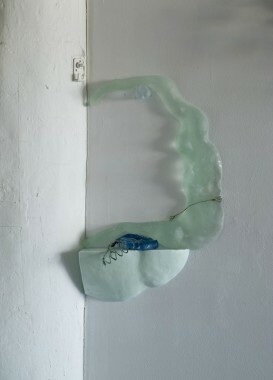 From scooters drenched in pools of blue and black to floating glass forms that capture the light of water and the movement of waves, all of Cohens work suspends time and mark moments of precarious exchange. 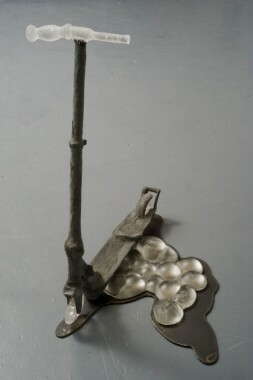 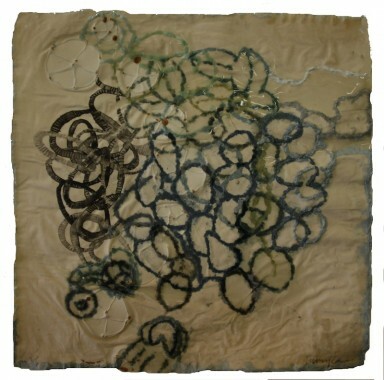 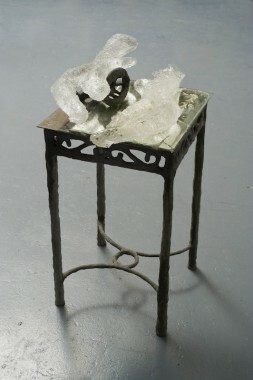 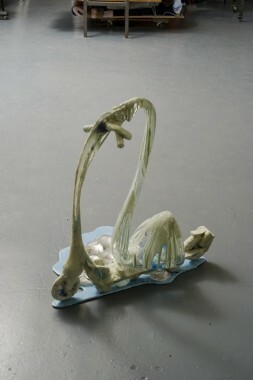 Nancy Cohen has a BFA from Rochester Institute of Technology and an MFA from Columbia University. 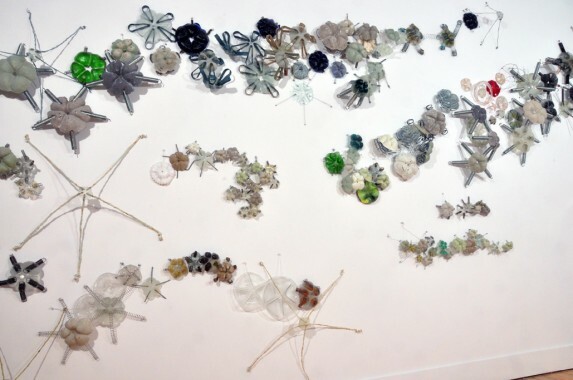 Recent large-scale projects have included installations in Karmiel, Israel, the CODA Museum in Holland, one based on the Hudson River for the Katonah Museum of Art in NY and a collaboration with marine biologists and environmentalists based on the Mullica River for the Noyes Museum of Art in Oceanville, NJ. 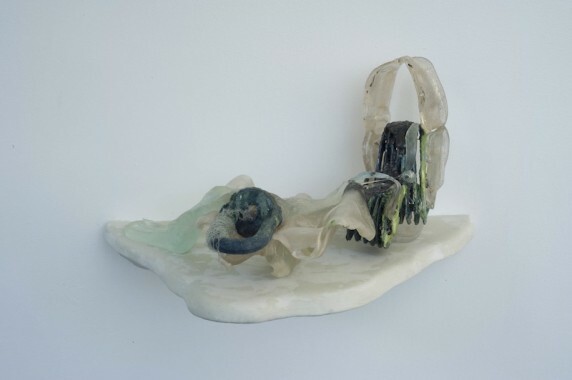 Cohen has been awarded a Pollack Krasner grant and Fellowships in Sculpture and Works on Paper from the NJ State Council on the Arts. 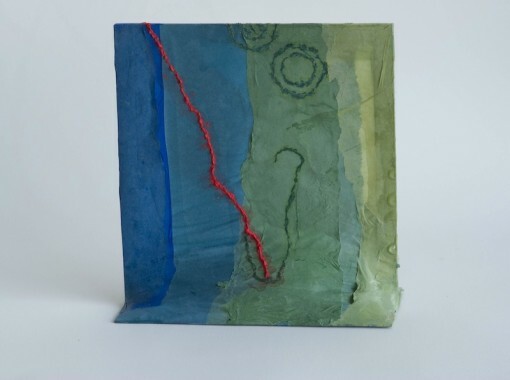 Her work can be found in the permanent collections of the NJ State Museum, Jane Voorhees Zimmerli Museum, Montclair Art Museum, & Yale University Art Museum among many others. 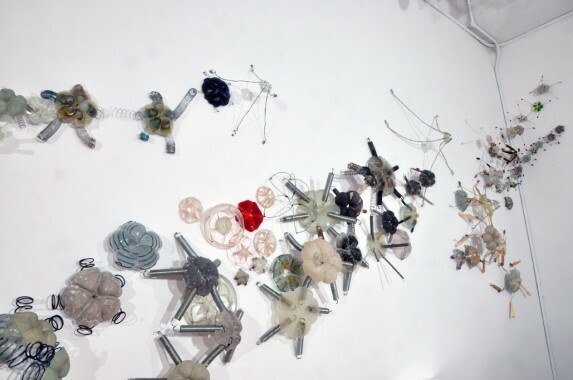 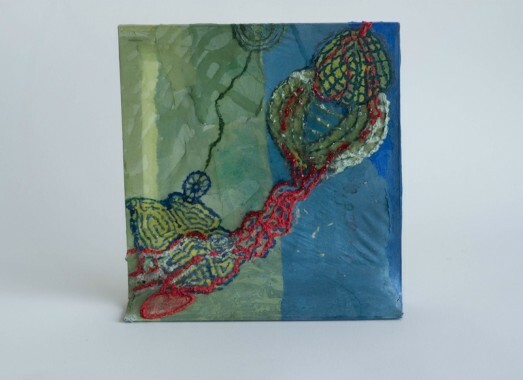 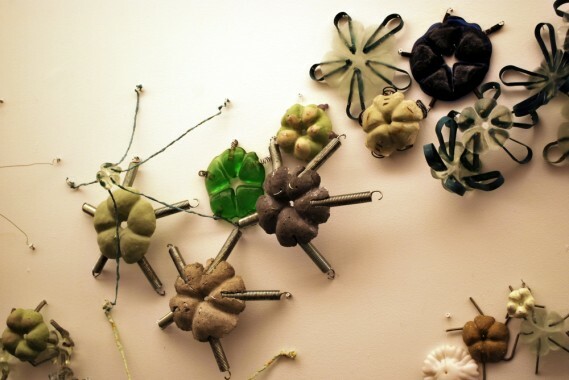 Recent exhibitions have included Permeable Matter a solo exhibition at Kean University in Union, NJ and Green: The Color & the Cause, at the Textile Museum in Washington D.C. Cohen was born in Queens, NY and lives in Jersey City, NJ. 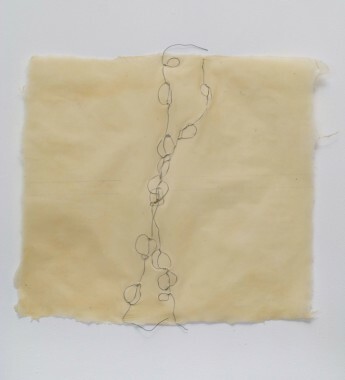 A catalog for the exhibition with an essay by Jill Conner is available.